Max Jones, 2016 NHL Draft hopeful. Version 4.0 will come out after the World Champions and possibly after the combine. 1) Auston Matthews – 6-2, 210 – C – When he goes in deep with the puck. Nobody stops him and then he can shoot or pass. He’s unselfish. Swats away pucks with great force on defense. He’s generational player. I’d rank him ahead of Jack Eichel for future potential. 2) Patrik Laine – 6-4, 209 – LW – He’s big, powerful, dynamic player. He can make the dipsy do dangle and snipe the short side. He can make a slick defensive play and get the puck going the other way. Great wrist shot from long distance too. Attracts the defense and can make a great pass to setup a scoring chance. Can slow down the game for his benefit. Laine’s toughness is why I have him ranked slightly ahead of his countryman. 3) Jesse Puljujärvi – 6-3, 203 – RW – He has all the tools. He can fly down the ice and get a goal. Can really stickhandle away from anybody, at that size, and doesn’t seem to have a favorite spot. He can score from all of them. Agile, hard to knock off the puck. If you try and block his shot he dangles past, makes a slight adjustment to get the shot off. 4) Matthew Tkachuk – 6-1, 195 – LW – He has rare poise and hockey I.Q. for such a young player. Fast enough, gets to the net. Has a quick release. Can go into traffic wth his head down. His skating is better than average. Has a pedigree that I like. 5) Olli Juolevi – 6-2, 183 – D – He has a lot of stick skills. Good stopping and starting speed. Excellent slap shot. Excellent on the power play. Patient waiting to make that first pass from behind the net. Has an active stick. Always has his stick down. Sneaky fast wrist shot. Great on the PK. 6) Pierre Luc-Dublois – 6-3, 201 – C – He has great hands, stick and puck control. Will lay a hit to make a play. Very strong on his skates. He plays solid defense. He has exceptional stamina. He powers well to the net. Coaches kid. Creates scoring chances for teammates. 7) Jakob Chychrun – 6-2, 214 – D – He’s come back strong from a shoulder injury. Has a big shot. Can lead the puck up the ice. His speed can be better. He has an amazing point shot and wrist shot. He can split the defense with fancy moves. He has a very fast, hard wrist shot that he can shoot in action. 8) Tyson Jost – 6-0, 194 – C – All around player. Heading to North Dakota next season. Goal scorer mentality. Playmaker as well. Captain for the Vees. Great vision. Excellent skater. Got caught off guard on defense because of agressiveness. Fast skater. Moves up the ice quickly with the puck. 9) Clayton Keller – 5-10, 168 – C – He plays bigger. Good on draws against older/stronger NCAA players. When Keller gets stronger, watch out. He looks like the fastest player on the NTDP. He’s a playmaking center. He has great hands and can draw penalties. BU commit. Made solid defensive plays. Keller is faster with the puck than anybody out there. Hard to keep up with and cover. 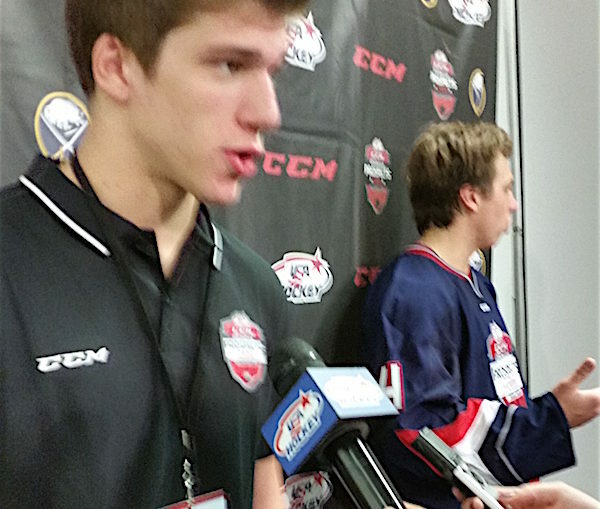 This year with the NTDP has been a record-setting one. His combined games effort make him the single-season assists leader (64) in the program’s great history and the all-time points leader moving ahead of stars like Patrick Kane and Phil Kessel. 10) Logan Brown – C – 6-6, 218 – Excellent passer. Causes matchup problems for the opposition. Lightning fast release on the break. Can make the big hit. Snapping off hard wrist shots. With a head of steam he’s hard to hold back. 11) Alexander Nylander – 6-0, 172 – RW – He can stick handle through major traffic. Has a rocket of a one-timer. Great on the power play. He’s a precision passer and can make the cross-ice pass. Back checks well. Excellent passing as usual. Left side on power play. Goes to the net. Streaks through the neutral zone. Tied Latvia game with a rocket top shelf one-timer in the u-18s. 12) Mikhail Sergachev – D – 6-2, 205 – Long reach, fast, can catch fast players from behind the play. Good passer. Very hard shot. Lays hits. Good under pressure on defense. Can make the long pass with accuracy and speed. 13) Luke Kunin – 6-0, 193 – C – In the AAP game he had the 2nd goal of the game. Fast shot. 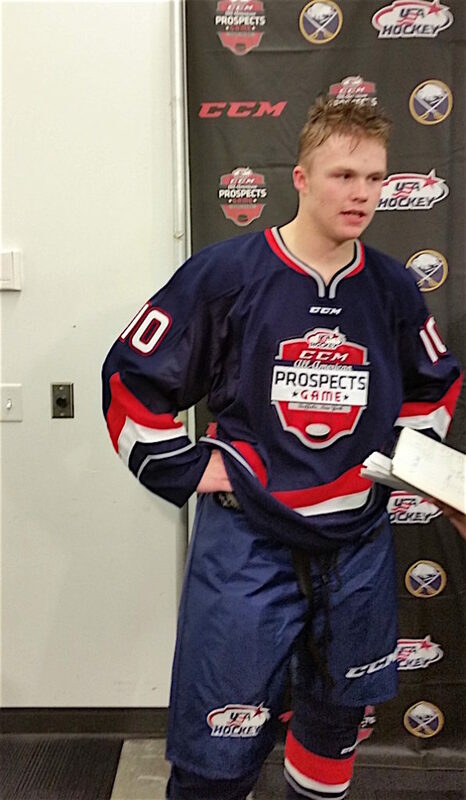 Scored 3 points and six shots in the All American prospects game. He’s a goal scorer first and playmaker second. Gets down the ice quickly for scoring opportunities. He really shined on a bad Wisconsin team. 14) Charlie McAvoy – 6-1, 211 – D – Good shot blocker and puck mover. Moves up the ice well. Has a sneaky fast wrist shot that he fires off on net with a defender on him. Plays in all situations. Nice block and moved the puck up the ice well. Up high on Team USA power play. Solid slap shot. Makes a good chip pass on the power play. Good wrister in close as well. 15) Michael McLeod – 6-2, 187 C – McLeod is a pivot with a goal scorers touch. He’s surprisingly fast on the rush. He can score from the slot with a quick wrist shot. He can play in all situations. He’ll bury the one-timer if you give him space. Can score with somebody on him. Has just enough speed to keep defenders at bey. Protects the puck well. 16) Dante Fabbro – 6-1, 185 – D – Stayed behind another year in the BCHL before going to BU next year. Two-way with a ton of offensive upside. Big shot on the power play. Power play quarterback. Plays strong defense. Power play. Good passing. Solid wrist shot. 17) Kieffer Bellows – 6-1, 195 – LW – Heavy shot. Fast release. Gets in on the goalie fast. Dominating at the NTDP. Will play at the NHL level like his father. Carries himself like a pro on and off the ice. Laid a nice hit. Skating well. Making sharp passes. Laying out players and then laying out to try and score is in his game. Strong wrist shot. 18) Max Jones – LW – 6-3, 201 – Nice goal on the rush. Fast shot. Moves well with and without the puck. Powerful play with skill and determination. Prototypical winger. 19) Jake Bean – 6-1, 170 – D – He is a guaranteed first round pick in the upcoming 2016 NHL Entry Draft. Decent skater. PP QB. Jumps into the play to score goals like a forward. Fast with the puck. 20) Alex DeBrincat – 5-7, 160 – C – Goal scoring center who buzzes through the crease area. Fast skater. Fearless. Plays solid defense as well. Has dominated at every level in his career so far. 21) German Rubstov – 6-1, 179 – C – Big centerman. Shifty skater. Solid stick and puck skills. Fast shot. Will shoot or dish. Decent pursuit on the defensive end. Has a great backhand. Excellent on the power play with a solid shot from the slot. Uses his size and makes good passes to get out of trouble. When he faced a stronger team he wasn’t as effective and lost some puck battles on the side wall. 22) Julien Gauthier – 6-4, 212, RW – Defensive awareness isn’t great. Lethal shot. Good wheels. Scorer. Sets up quickly to score. Looked good in International play. Scored a pretty goal down low proving if you’re around the net offensively good things can happen. He has a fast shot. Gets his wrist shot off quickly with force. Plays on the power play. Has a decent one-timer that can improve. Impressive for a late ’97. 23) Brett Howden 6-3, 190 – LW/C – His older brother Quinton, was selected by Florida in the first round of the 2010 NHL Entry Draft. Big kid. Good offensive ability. Has a frame you can build on. Goal scorer. 2-way. Skates well. Physical. Hockey i.q. is high. Strong. Overpowers defenders to steal the puck. Thinks fast. Scores down low. Good on draws. 24) Dillon Dube – 5-10 – 181 – C – Presents the stick well. Works at top speed. Passes with ease. Can turn the corner on defenders to get to the net. Great on the PK. 25) Riley Tufte – 6-4 – 205 – LW – Skates well. Very strong down low. Can really work the puck out of the corners and can thread short passes to the crease area for scoring chances. Hard to contain by the lower hash marks. Fast accurate shot from the slot. 26) Pascal Laberge – 6-1 – 173 – C – Great shot. Good speed. Playmaker. Likes to shoot. Really fast shot from the slot. Strong forecheck. 27) Rasmus Asplund – C/LW – 5-11, 176 – Starred in the WJC. Skates great. Moves well without the puck. Knows where to go. Works well on the walls. Can make the tough passes that become scoring chances and goals. Skates very wellCan score from far out. 28) Taylor Raddysh – 6-2 – 198 – RW – Decent speed. Not that physical yet. More engaged on defense. Highly skilled. Can make difficult passes look easy. Plays mainly on Alex DeBrincat’s line and some with Dylan Strome. 29) Samuel Girard – 5-10, 165 – D- Good puckmover. Proficient on the power play. Shoots the puck well. Hard hitter. Good on the PK. 30) Simon Stransky – 6-0 – 170 – LW – Is from a Czech hockey family and this left winger is hoping to become the first to become an NHLer. Good passer. Accurate shot.